How to Clip a Chicken's Wings to Prevent Flying Away - Oh, The Things We'll Make! Keep your chickens safe in their enclosure by learning how to clip a chicken's wings to prevent it from flying away. It's easy and only takes a few minutes. 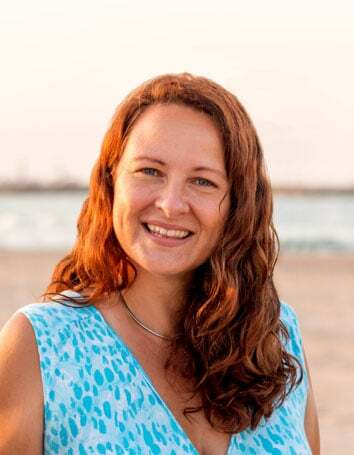 You may have noticed on Facebook, Instagram or YouTube that lately I've been making a lot more videos, both for my new posts and for some of my older ones. My newest videos are all mostly quick, short videos that show you, more or less, the process of me making some of my recipes and DIY products. While going through some old footage, I found this video that I had filmed two years ago, and that I had planned on sharing here on the blog way back then, but never got around to it. The video I found was all about how I clip my hens' wings to prevent them from flying out of my fenced in enclosure. 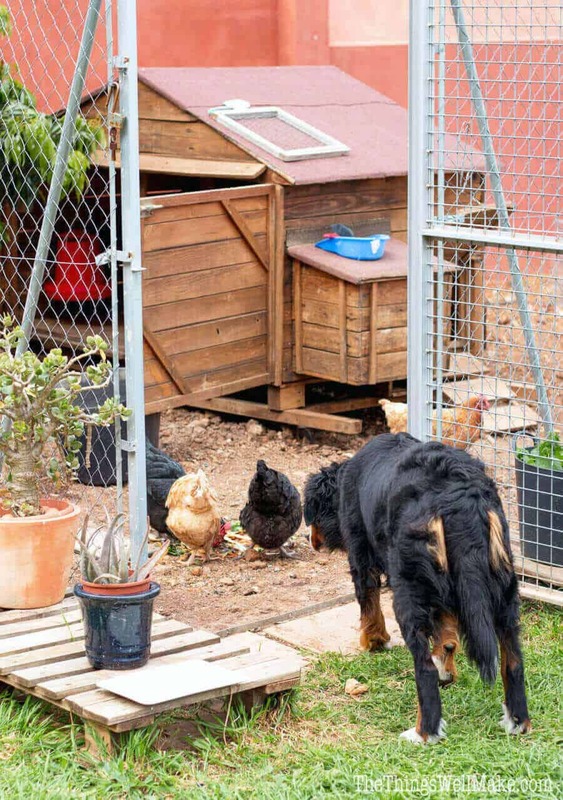 When we first got our hens several years ago, I told you my horror story about how my Bernese Mountain dog killed one of the hens that had escaped from the enclosure. I was heartbroken and super mad at myself for ever letting it happen. We came up with a few solutions to prevent that from ever happening again. At the time, we immediately built a 2 meter high fence around our DIY chicken coop (someday I'll have to show you how we made our coop from old pallets), and that helped us keep the hens safe for awhile. I was worried about my dog digging her way in, so I showed you how I kept our dog from digging under the fence using pallets. While my dog no longer tries to dig to get to my hens, I still am using the pallets because I think the whole area looks nicer with them there. My hens were once again safe…until they started flying out of the coop, of course! One day I noticed that one of my hens was hanging out outside her enclosure, with no way to get back in. I was relieved that I hadn't let my dog out yet, and once again was concerned with their safety. Later that afternoon, I clipped the hens' wings to prevent them from flying out of their enclosure when I wasn't around to keep them safe. The funny thing is that by now, these are non-issues. Little by little I accustomed my dog to being with the hens, and by now I am able to leave her alone with the hens all day without any problems, even when I'm not around! So, yes, even an evil hen predator like my sweet Bernese Mountain dog can be rehabilitated and reformed into an angelic (OK, not quite) hen protector of sorts. I like to think that her being around the hens now keeps other predators away from them when they are out of their enclosure. So, keep that in mind if you have similar problems with your dogs and chickens. With a little bit of love and careful, supervised introduction, you can (probably) get your dog to leave your chickens alone. I did. I guess I should just get to the point, right? All of this introduction was to tell you that I no longer worry about clipping my hens' wings to keep them away from my dog. They are now good friends. 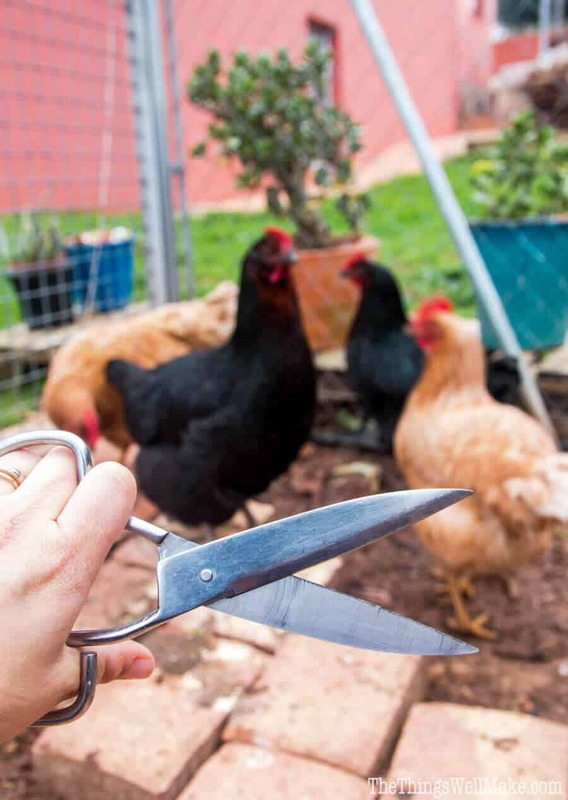 I'm not planning on clipping their wings this year, but I will show you how you can do it if you are having similar problems with your chickens leaving their enclosure when you don't want them to. Does clipping a chicken's wings hurt them? Let's be honest. I was afraid to do it at first because I was afraid I was going to do something that would hurt them. You aren't cutting the chicken's wing and you aren't actually removing any feathers. You are only going to cut off the very tips of around 10 feathers on each chicken, the primary flight feathers on one wing. Don't cut too far down the feathers because you can risk clipping into the area with blood circulation and cause bleeding. Also, stay away from any newly forming feathers. As long as you follow these tips, you shouldn't have any problems. Why do you only cut the tips off one wing? The idea is to throw off the chickens' equilibrium so their flying isn't as controlled. 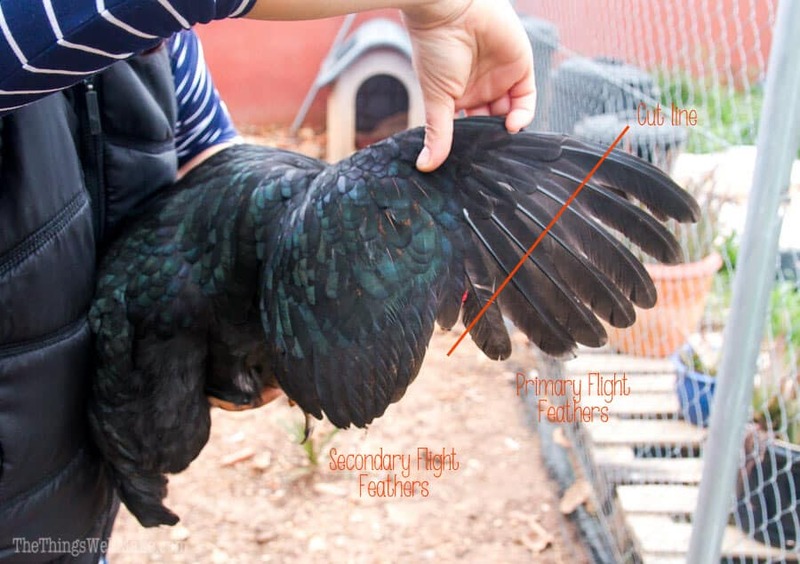 If you cut the tips off the flight feathers on both sides, the chickens may learn to control their flight again without the tips of those feathers. Will this prevent the chickens from flying? Will it keep them from being able to roost? Every winter your chickens will molt and lose their feathers, and new feathers will grow in their place. That means they will also lose the clipped feathers, and new, long feathers will grow back instead. I forgot about that the second winter when one night I stepped outside because I heard a strange noise. I was surprised to find my dog hovering over my favorite hen who had flown out of her enclosure and was making a strange sound, probably out of fear. I ran to grab the hen with my heart pounding, and was relieved to see she was OK. I wasn't ready to lose yet another hen to my dog! At the time I had already started to slowly introduce my dog to the hens, but I still didn't trust her when I wasn't around. I brought the hen back to her perch, and the next day I clipped their wings again first thing that morning! This time of year my hens finally have their new feathers, and it's the perfect time of year to clip their wings again. Grab ahold of one of your chickens, and hold the chicken against your body, keeping one of the wings pressed against your chest so that it can't fly away from you. 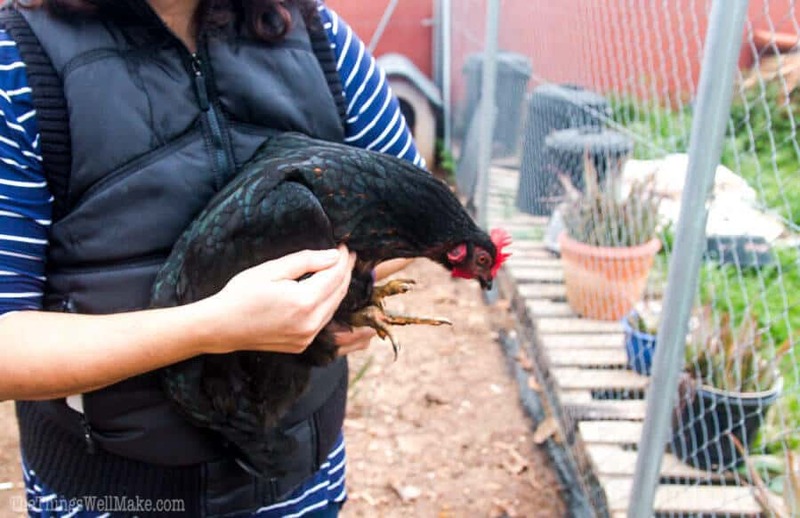 Give the chicken a little time to calm down so you can easily and safely handle it. Carefully pull the other wing up away from the chicken's body so that the feathers fan out. Look carefully at the wing. You'll notice that around halfway down the wing, the types of feathers at the bottom of the wing change into longer primary flight feathers. We will be cutting the tips off those longer flight feathers. Normally there are around 10 of them to cut. Notice that the wing has several rows of feathers. Cut the primary flight feathers just below the tips of the second row of feathers. Look at the picture above to see, more or less, where your cut line should be. That's all there is too it. Your chicken should still be able to fly short distances, but shouldn't be able to fly out of its enclosure. Thank you!! It was comforting to hear that you were a little intimidated at first also. I’m a new chicken owner and was terrified of clipping until I saw this. It was also very informative to shoot video of both hens being clipped. Good to know how to hold them and clip with o e hand. Thank you SO much! I’m happy to have helped. I should say that it worked beautifully with those hens. Sadly, I only have 2 of those left and one is rather sick with egg peritonitis. We are planning on draining her belly in the next day or so, as soon as the needles I ordered arrive. I hope to prolong her life a bit more, as long as she can live happily. She won’t be able to lay, but we don’t care so much about that. Those girls are over 6 years old now. We since got 2 new white hens and the new breed is very lightweight and they love to fly. I have clipped their wings, but one is very clever and jumps on the coop, then jumps on the cement wall between my house and the neighbors’ house before jumping off into our yard. My husband gets sick of her leaving poo all over our patios. Oops! For now we just deal with it. We could try to move the coop, I guess, but it’s probably not worth it for us at this point. So, while they can’t fly high, keep in mind that some are very clever and will find ways to do what they want anyway. I wish you the best of luck with them. They are lovely additions to the home.